Occasionally, we like to have take-out sushi for dinner. When we do, I will make either fried rice or these Asian Vegetables as a side dish. 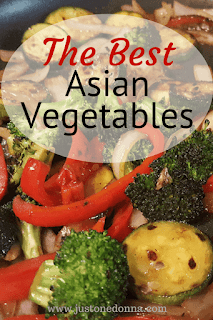 I particularly like these Asian Vegetables as the side dish because I leave the veggies in big enough chunks to make them easy to eat with chopsticks. After all, chopsticks are part of the fun of eating sushi for dinner! My vegetable preferences for this side dish are broccoli, zucchini, red bell pepper, and onions. It is a simple, but delicious, mixture that is easy to whip up while the sushi is being fetched. The Asian flavor in this vegetable dish comes from a simple and easy to prepare sauce. You can use any vegetables you like but these are colorful and complement the sushi well. To bulk up the dish and add some crunch think about adding some chopped bok choy or sliced water chestnuts. The sauce I use is my go-to sauce for all things Asian. It is a mixture of soy sauce, rice vinegar, sesame oil and ginger paste in a 3-2-1-1 ratio. It is easy to adjust the amount of sauce you make using the ratio. For my sushi and Asian Vegetable dinner, I would double the recipe, using tablespoons. Half of the sauce would be used as a dipping sauce for my sushi. Notice the nice color on the zucchini in the picture above. I like to get the zucchini nice and browned for added flavor. One of the keys to success in preparing these vegetables is to have a big enough pan. You don't want your vegetables to steam so they need room to spread out in the pan. 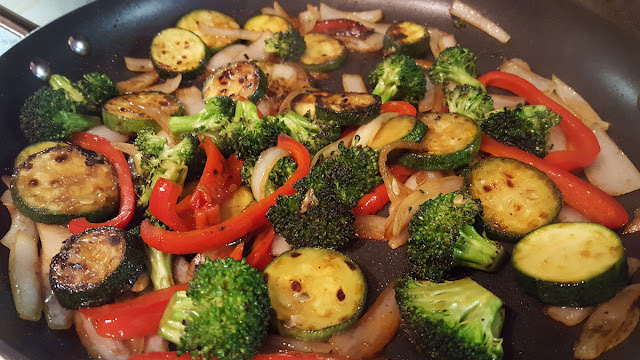 I use this 14-inch Rachel Ray frying pan (affiliate link) to make these vegetables and it is a perfect size. Colorful and crunchy vegetables in an Asian sauce make a yummy side dish for takeout sushi. Mix together the soy sauce, rice vinegar, sesame oil, and ginger paste in a small bowl. You can mix in a tablespoon of cornstarch to thicken the sauce as it cooks. I don't. It's totally optional. Lay the zucchini slices in the pan, cut side down so they will brown nicely. Cook until browned on one side and then flip. Remove from pan. Add the broccoli, onion, and bell pepper to the pan, spreading them out so they are not crowded. Cook until they have softened but still have some crunch. Add the zucchini back to the pan. Pour the sauce over the vegetables and stir to combine. Cook for a minute or two in the sauce, letting the sauce reduce a bit. Get the recipe for Better Than Takeout Fried Rice. Get the recipe for oven roasted cauliflower. Thank you for sharing this post on Pinterest, Facebook, Twitter, and Yummly.